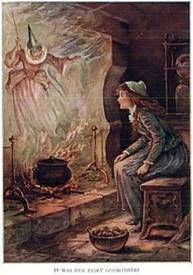 Cinderella with the Fairy Godmother illustrated by Oliver Herford. 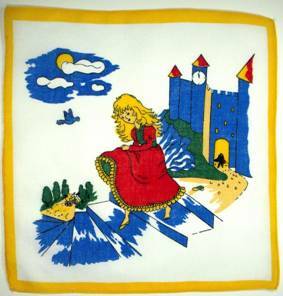 Originally, we spied Cinderella on a delicate silk child’s handkerchief. 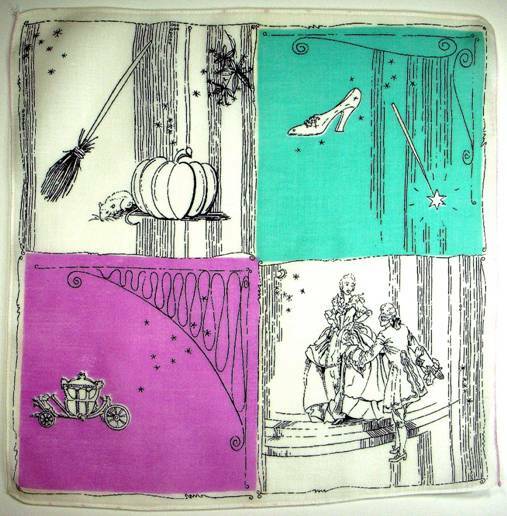 As we discovered, children’s hankies were often adorned with fairy tales to keep them amused, much like the ubiquitous ipad is employed today. 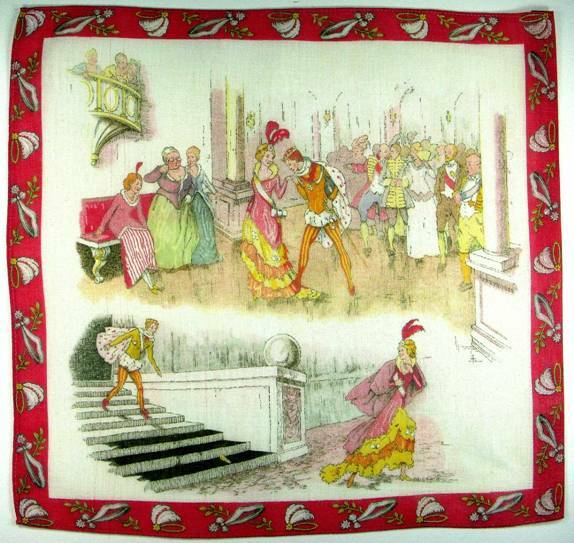 (except a hankie can also dry your tears…) Here, a valiant prince pursues our runaway damsel. Her tiny slippers sport adornment resembling a cat’s whiskers. Note her teensy lost shoe floating above the “Cin” in her name. What a charming image upon which to daydream. 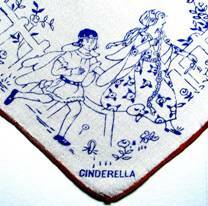 My favorite Cinderella handkerchief shows our heroine at her loveliest, while the three step-dragons gape from the sidelines. The border contains alternating images of her sash and feathered hairpiece. As the only woman wearing a sash, the subtext seem to intimate that on some level, she is innately royal and belongs with the palatial elite. Yet, as we know from Joseph Campbell’s Hero With A Thousand Faces, life’s triumphs are often preceded by adversity and hardship. 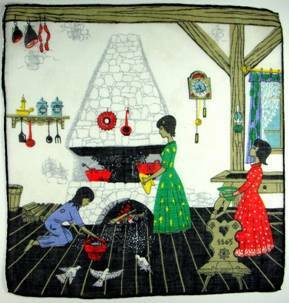 In the images below, Cinderella toils alone and forgotten. 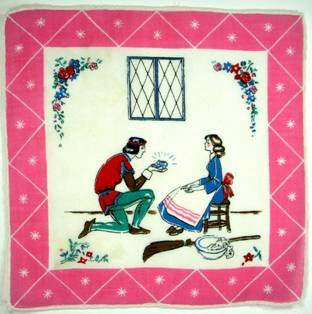 Note the carved chair dated 1865 and the cuckoo clock on the left, as well as the wooden clogs on the right, details which indicate these handkerchiefs take their cue from European storybooks. 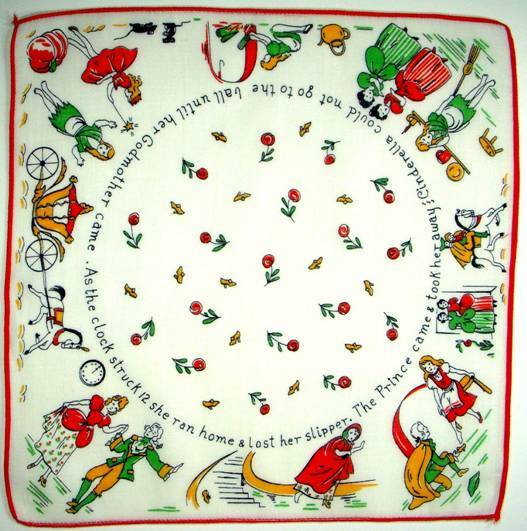 The second hankie above is one of a trio which leads to a happy ending. 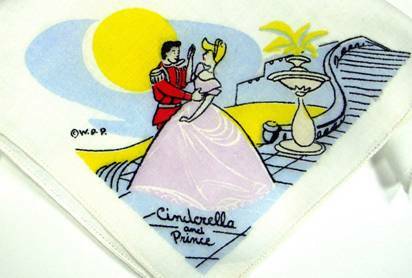 For most of us raised in the U.S., our vision of Cinderella derives directly from Disney’s wonderfully animated movie, originally released in 1950, and enjoyed for generations since. 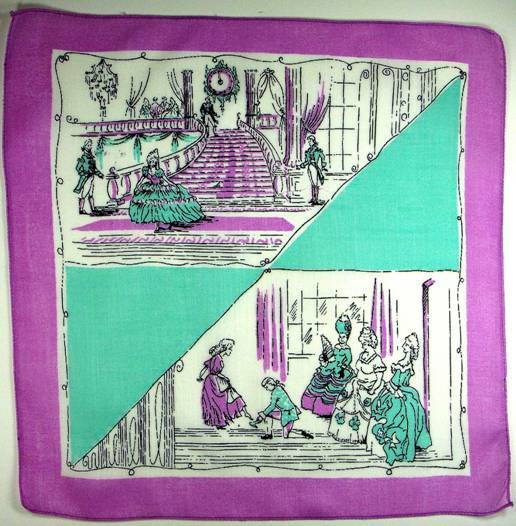 A terrific trio of hankies for a young lady/future princess. Who knew those little coachmen had names? 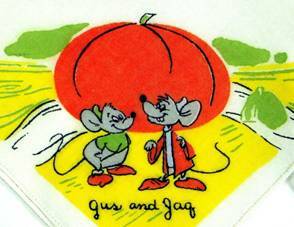 Gus and Jag. There’s your trivia tweet for the day. Would one in a million people know the answer? Ah, but you have a hankie to prove it! And you can direct them here for validation. 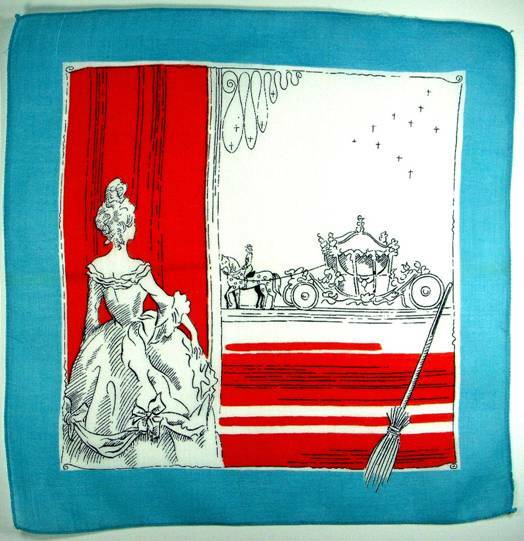 One of the cleverest handkerchief renditions depicts the princess watching her carriage arrive. Inside the border we find all things royal, while outside the border rests a broom, a lone vestige from her former life. No titles needed here; we know exactly who the lady is. A quartet by the same artist that’s clever, creative, and fun. 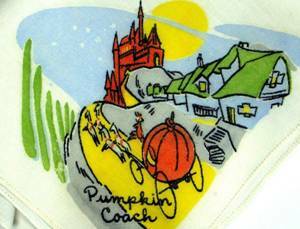 Were a child not to know the story, this hankie could serve as a storyboard to assist a nanny, granny, parent (or fairy godmother) in bringing the tale to life. From mouse and pumpkin, to slipper and wand, we know whose world we have entered. The simplified graphics allow plenty of leeway for imagination to take flight and spin a grand tale. A diagonally split screen sums the story up in two words – Lost…and…Found. The perfect gift for a true romantic. Below, the tale swirls round and round to tempt, charm and delight. 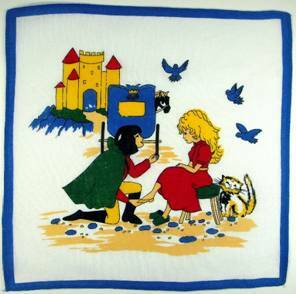 I love the final image – the stepsisters are left behind, while the prince sweeps Cinderella onto his steed, to gallop off into the sunset. And the pièce de résistance, the perfect pas de deux – the Cinderella ballet. In the actual ballet storyline, her dream is to become a ballerina; while dancing with the prince, her dream is brought to fruition. 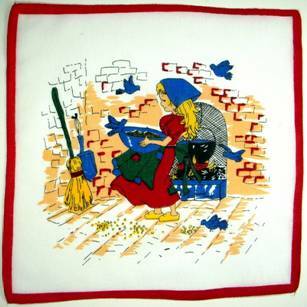 Why multiple blogs on Cinderella? 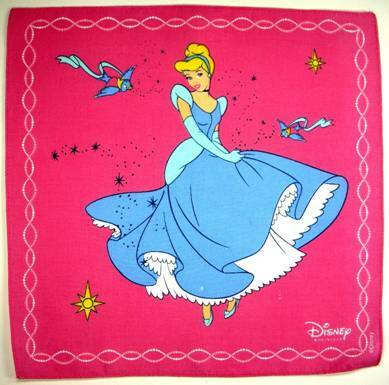 Aside from the fact that movies, Broadway and the ballet can’t get enough of her (Pretty Woman, the movie that shot Julia Roberts to stardom is described as a Cinderella story), there are handkerchiefs galore on the topic, and it’s fun to view different interpretations. Some depict hardship, others opt for a happy ending. 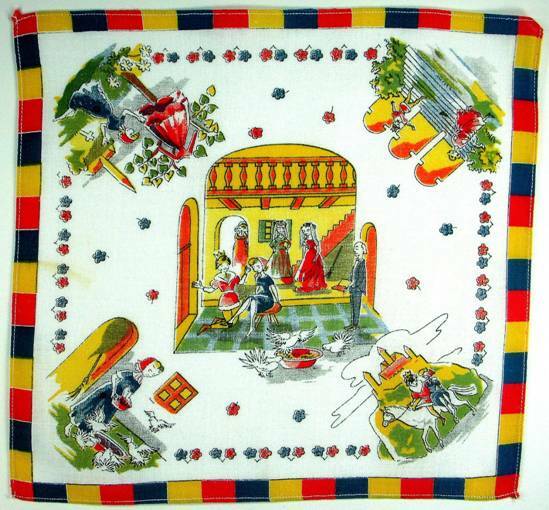 When possible Handkerchief Heroes strives to showcase a variety of artists on a single topic. Like voices blended in harmony, it seems to make the overall melody richer. Do enjoy! And many, many more. 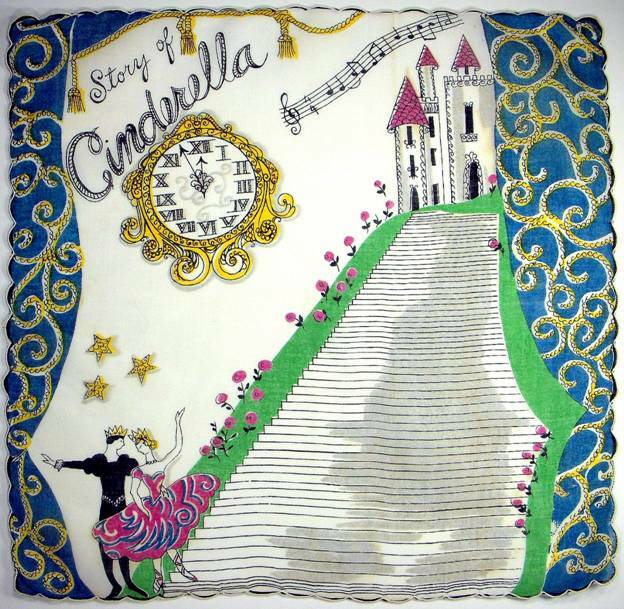 Please browse and enjoy…..
And if you have a Cinderella story, we’d LOVE to hear it. This is all really amazing Ann. It is wonderful. Will it ever be out in book form? It is museum show worthy actually. So grateful for your kind words; they’re much appreciated.The blog is a labor of love and I’m honored you took the time to read and respond.